The CTR represents the expression "Choose the Right," a common thread in the ideology of The Church of Jesus Christ of Latter-day Saints, more commonly referred to as the Mormon church. 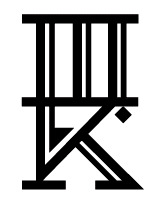 In essence, Matt explained, it means "follow the right path". Its akin to a mantra eschewing sinful activities frowned upon by the church like drinking alcohol, smoking cigarettes, doing drugs, and, yup, you guessed it: getting tattooed. 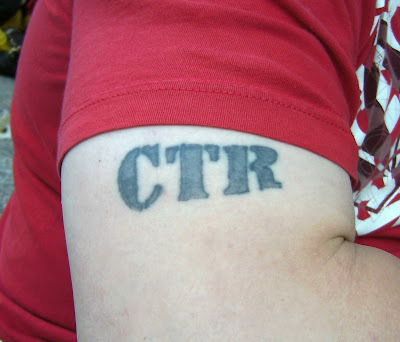 Matt finds great power in this tattoo because it represents an oxymoron: the letters CTR stand for a way of life that is contradicted by the fact that they have been tattooed on flesh. It would be like a Jewish person having the phrase, in Hebrew, "You shall not make gashes in your flesh for the dead, or imprint markings upon you: I am the Lord" tattooed on them. As a tattooed Mormon, this is Matt's way of addressing,and coming to terms with, the disparity between faith and his love of tattoos. 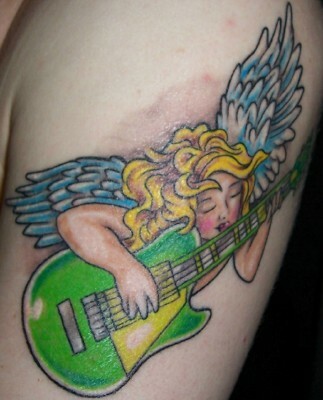 This was tattooed by a friend of his in Ogden, Utah. Thanks to Matt for sharing his ink with us here on Tattoosday! It probably happened unintentionally, though, unlike Matt's tattoo.